I began watching my taped coverage of last year’s; Err two years ago, or is it three? Guess time really does FLY when you’re having fun, eh? ‘Twenty-eleven 24 Heurs du Mans after the Vancouver Canuks had gone down 3-0 on a short-handed goal by those devious Boston Bruins during the first Power-play for the ‘KuhNucks with just a few ‘My-nutes remaining in the second period of Game-6, or was it Game-7? Thus upon giving up on duh ‘KuhNucks in disgust, I began watching the 30mins Pre-race banter on SPEED which along with other quips saw Justin Bell talking to whom I affectionaly call “Symone Pagenoe” (Simon Pagenaud) who claimed that he hadn’t been going for outright speed during Qualifying; Huh? As ‘Symone had qualified P3 behind the front row being locked-out by the Audi R18 TDi Panzerwagon’s; Ja Volt! As apparently Simon was being the master of understatement. But I found it funny to hear Justin note how a whole Grandstand was chanting ‘C-Monn for the French Racing Star; as it was quite amusing that they didn’t talk to ley Ham-burgle-leur, nee LeMans, France Homeboy Sebastain Bourdais, and also known Stateside as ‘SeaBass... Oh Whale, guess he’s not Top Banana at Peugeot, eh? As they (SPEED) also interviewed the very amusing ‘NickM, aka Nicolas Minassian; DAMN! It’s hard to believe it was so many years ago when he was the Cheepster’s Punching Bag as a rookie IndyCar Piloto, eh? As in does anybody remember when he ran the Indy 500 in Twenty-oh-One as part of ‘Cheep’s replacement package Dealio for letting ‘MAC MONTOYA (Juan Pablo) go Across-the-Pond to Sir Frank’s Team Willie outfit. As in Minassian was Bruno Junqueira’s Wingman at TCGR after Junqueira bested the Frenchman for the F3000 International title in 2000. As it was this race where I’d caught Justin Bell’s hilarious “Crowd Crawl” antics and subsequent humour from the Speed Geeks ‘bout it being Monsieur Bell’s final race before he went off into the wilderness to write books that got me to corral Justin into doing an interview for this blog. Yet I do recall rootin’ mightily for Symone to pull off the upset victory for Peugeot - as the Frenchman teamed with le ‘Hamburgular and Pedro Lamy chased down the lone surviving Audi TDi R18 No. 2 racecar of Benoit Treluyer, Marcel Fasller and Andre Lotterer - finishing a miniscule 13.8-seconds adrift of Lotterer for the fourth closest finish ever. Obviously I wanted Pagenaud to win since I’m such a HUGE fan ‘O his! Ever since he kicked ARSE in the American Le Mans Series after his short lived Champ Car career... Although I cannot say that I was pulling quite as much for Bourdais, whilst Lamy’s claim-to-fame? Is breaking both of his legs during a practice shunt at Silverstone for the long departed Benetton F1 Team; YIKES! , Audi’s win was the first from Pole-position since 2003, when “Mr. 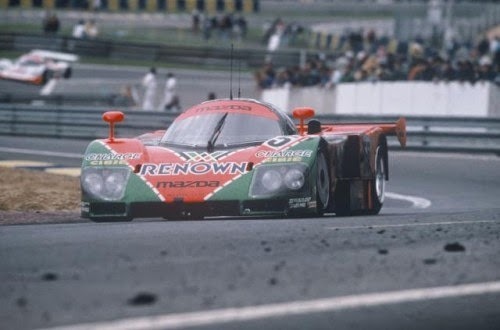 Le Mans,” (Tom Kristensen) took his Audi derived Bentley Speed-8 (assisted by Reinhold Joest) with co-drivers Dindo Capello and Guy Smith to the podium's top-step, as it was Benoit Treluyer capturing Pole position this year. And I was also extremely happy for the little team that did in the GTE-Am (Amateur) category of the French classic, as it was none other then Robertson Racing with its Ford GTR, paying homage to those iconic Ford GT-40’s of yesteryear... As not only did David & Andrea Robertson celebrate their wedding anniversary on the podium at Circuit de la Sarthe, they also made history by becoming the very first husband-wife duo to do so. And making further history was the fact that Leena Gade became the very first ever female Race-engineer to win at Le Mans, which I didn’t discover until the following year.